Things may get a little muddy when Venus in Libra and Mars in Pisces decide to join forces. Though this air and water duo both have a romantic bent, they express it in very different ways. Certainly, as a couple, they share a heightened sensitivity to life and a love for beauty, but while Mars in Pisces is getting down with the spiritual life, Venus in Libra would much prefer to go shopping. This is not to say that Venus in Libra is shallow—au contraire—for this Venus really knows how to love. With an innate understanding of how to let the little things go, Venus in Libra navigates the rocky waters of relationship with grace and charm. She understands that ultimately, maintaining a connection with your partner is more important than who’s right and who’s wrong. Mars in Pisces‘ poetic nature and sweet demeanor make him hard to resist. 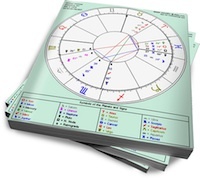 This Mars sign can’t help but to sense what his partner is feeling, as he can be so sensitive. (So much so that he sometimes needs protection.) But Mars in Pisces’ inner warrior does emerge, even if it is in the most mysterious of ways. His martian flair is roused most often in defense of others. This Mars needs a little escape mixed in with his romance, as he desires to keep on dreaming, even in the midst of the day-to-day routines of relationship. Venus in Libra can provide Mars in Pisces with a beautiful and soothing respite from the cold, hard reality of the world, decorating their love nest with flowers, art and her own special brand of charm. Mars in Pisces keeps the romance alive for Venus in Libra, awakening her appreciation for the more subtle realms of life.